Many worldwide amphibian population declines and mass mortality events have been attributed a fungal infection chytridiomycosis (chytrid) caused by the fungal zoospore Batrachochytrium dendrobatidis. The fungus infects amphibians in their keratin containing skin layers. 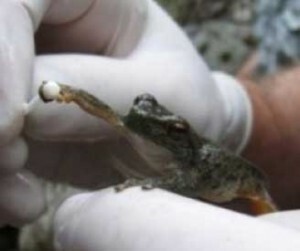 Frog tadpoles have keratinized mouthparts which can become infected. As amphibians grow they develop more keratinized tissues which can become infected and cause skin to become thickened and slough off. Amphibians use their skin for respiration; this makes it difficult for them to absorb water and important salts causing their heart to stop.The fungus also damages the nervous system, affecting the amphibian’s behavior. Once infected, the amphibian may have discolored skin from sloughing, or peeling on the outside layers of their skin. Infected amphibians are commonly found in a lethargic state and refuse to move. Signs of infection can be seen within 12-15 days following exposure. When a pond has become infected with Chytrid fungus, the fungus could stay in the water forever. This makes it is very important not to move frogs or amphibians from one area to another. 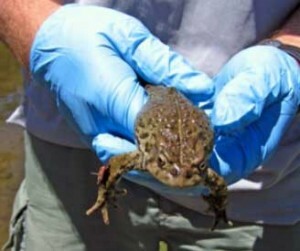 Chytrid fungus has been found to not tolerate temperatures above 82 degrees Fahrenheit. The chytrid fungus is known to occur in Nebraska and has been found in amphibian populations located in eastern Nebraska as well as along the Central Platte River. The Nebraska Cooperative Fish & Wildlife Research Unit (Univ. of Nebraska) is conducting statewide surveys swabbing tadpoles and frogs to determine presence/absence of chytrid in amphibian populations. There is genetic and historical evidence that Batrachochytrium dendrobatidis (Bd) has been present for a long time in Africa, Japan and the eastern North American and all have been proposed as the possible site of origin. Although the exact origin of Bd has not yet been determined, it has become clear that global trade in amphibians for food, for use as laboratory animals, or for use as pets or display animals is responsible for movement of Bd to locations where it was not previously present. Adults have an enormous appetite and can eat anything they can catch and swallow, including birds, fish, crustaceans, bats, snakes, turtles, and other frogs. A high reproduction rate and limited predation allow it to quickly establish itself and dominate a variety of native species causing their decline. Learn more here.